Holidays Onboard Liveaboard Tips: Decking the halls is a little more challenging when you’re trying to be festive on a small, floating, fiberglass tub. 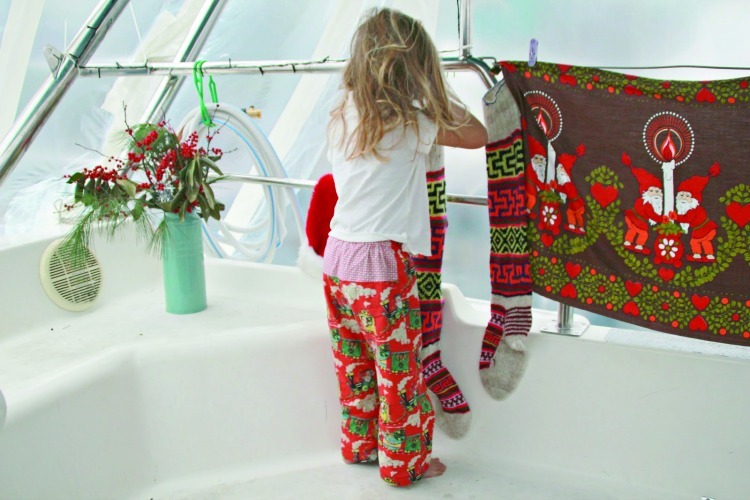 Whether you live aboard or just want to make your boat merry for the holidays, there are many ways to decorate and celebrate the winter season onboard. The most obvious way to bling out your boat for the holidays is with lights. Holiday lights parades all over the Chesapeake bring out the best and biggest in light displays on boats. If you have it in you to create a fabulous, animated light display to hang in your rigging, then go for it. The rest of us can just keep the season bright by running a simple string of lights up the mast, across the boom, or around the bimini or lifelines. There’s nothing quite like looking across your marina and seeing lights on boats all around you. Don’t underestimate the value of indoor lighting on your boat. On those long, dark nights of winter it really brightens the spirit to have a string of lights running inside the cabin. Some boaters keep them up all year and call them “twinkle lights” rather than Christmas lights. These days there are a lot of choices in string lights from 12 volt to LED to solar and every imaginable color. If you celebrate Christmas, having a tree is a central part of the festivities. But the limited space on a boat makes a tree more of a treat than a necessity. 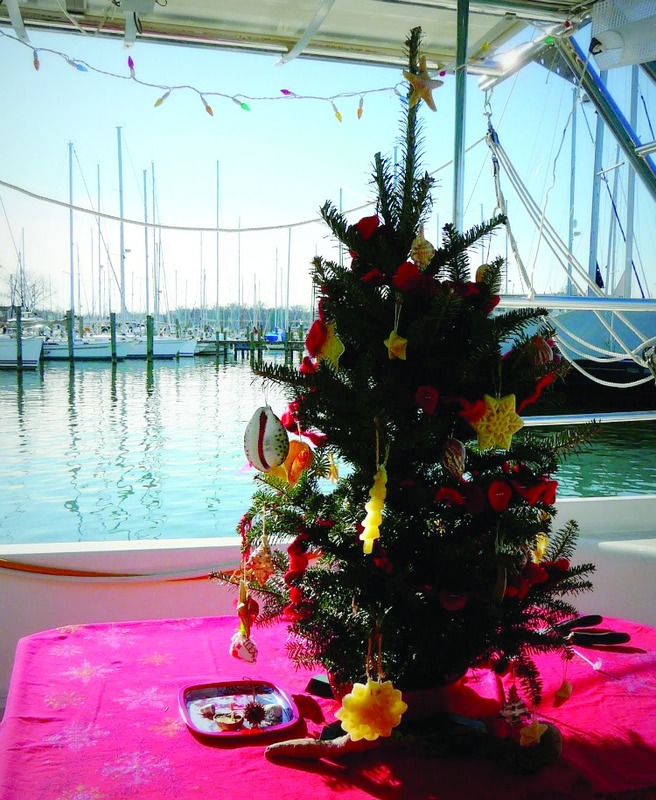 Some boaters go all out with a fairly full-sized tree, real or artificial. Many opt for the little table-top version that can be plunked on the salon table or out in the cockpit. Then there are the creative tree alternatives that pop up in various sailboats. A popular version is wrapping a keel stepped mast in something green and decorating the mast pole that runs through the cabin. Another alternative is a paper cut out of a tree tacked somewhere convenient. Some boaters use green lights inside the cabin to create a tree-like shape. Tree shaped creativity can be a tradition in itself. Some boaters make trees from holiday cards, ribbons and bows, booze bottles, palm fronds, and even painted green cans. Whatever fits your space, budget, and taste can work out just fine. Anything made from fabric is always a win in a small space. We have garland made from vintage Christmas fabric and gift wrap bags made from vintage Christmas tablecloths that we re-use every year. Holiday themed pillowcases are an easy way to get in the spirit. And vintage Christmas tablecloths can transform your salon into a holiday centerpiece. Just hanging Christmas stockings makes the boat look festive. The best part about decorating with anything fabric is that you can easily clean it, fold it up, and store it away with limited space. Garland is a go-to decor for cruisers and liveaboards who want to seem festive without the fuss of recreating land dwelling decor. A tree can be a bit much or all together not possible depending on where your boat is for the winter holidays. Making or buying garland is easy and doesn’t take up valuable space. Cut up old magazines or catalogs and make paper chains, or even use old pieces of wrapping paper to make it more Christmas-looking. There are so many ways to deck out the inside from long lengths of tinsel garland, to faux pine boughs, to colorful knotted yarns, to painted sea shells. One way to stay in the spirit of the season without having a holiday box to store onboard is making things that can be consumed, recycled, or put back out in nature. 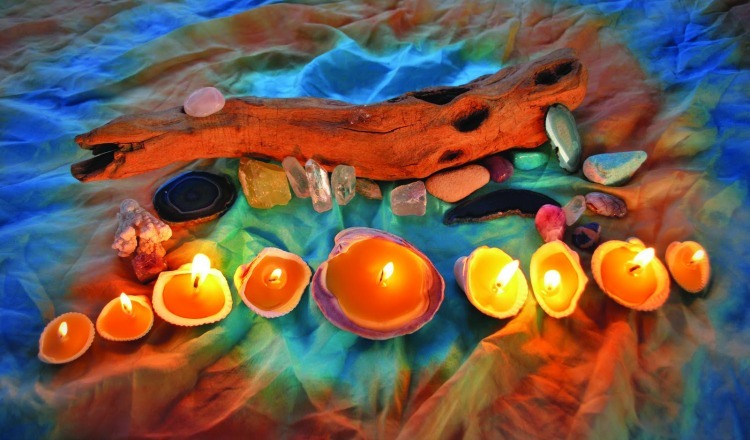 We’ve made Menorahs from seashells, tree decorations made from cookie dough or dried fruit, and decorative trinkets made from beeswax that can be melted down and made into something else later. As we’re all told when we’re kids, it’s not things that make the holiday spirit merry and bright, but the together time and traditions. Even if you don’t decorate your boat at all, there are still so many holiday traditions that are easy to do onboard. Bake cookies, listen to holiday music, make hot cocoa or spiked drinks, take photos with silly Santa hats, read traditional holiday books out loud to your children, or invite your neighbors over for a meal. 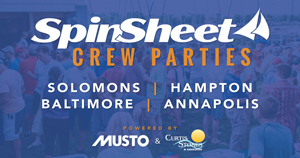 There are so many ways to celebrate the season and so many ways to deck out your boat. More than anything it’s a good time to stop and be grateful for fair winds, following seas, and all of the little things that make life sweet.